Built with four 10 Gb/s USB 3.1 Gen 2 Type-A ports, each of which has its own dedicated controller, the RocketU 1344A 4-Port USB 3.1 Gen 2 PCIe 3.0 x4 HBA Controller Card from HighPoint allows users to connect four USB 3.1 Gen 2, USB 3.1 Gen 1, USB 2.0, and USB 1.0 devices to their compatible Windows 8 and later, Mac OS X 10.9 and later, or Linux system using a PCIe 3.0 x4 slot. As each port has its own dedicated controller, that means that each port has 10 Gb/s of dedicated bandwidth, as compared to 10 Gb/s being shared between four ports. 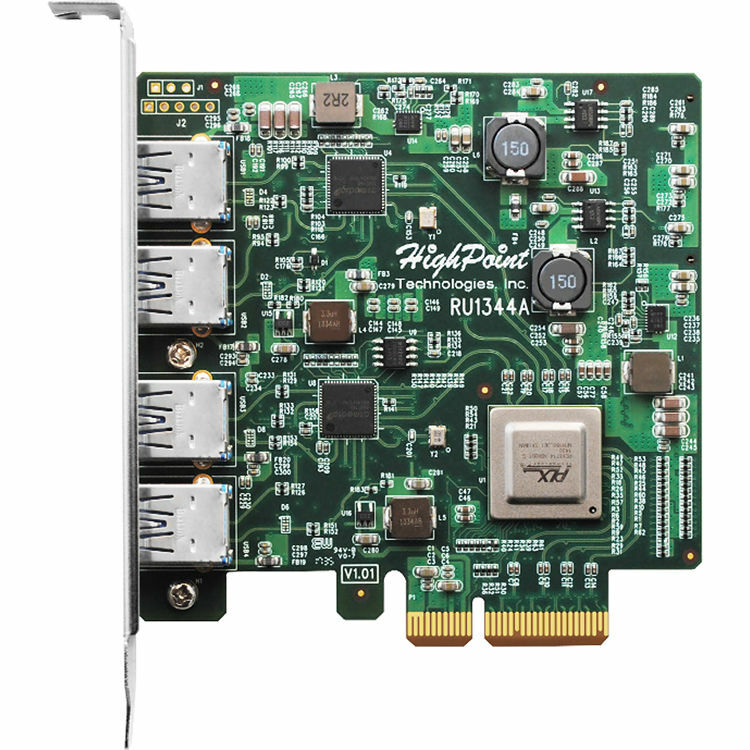 This card has a full-height form factor and can be used to connect to external drives, docks, drive enclosures, printers, scanners, mice, trackballs, flash drives, card readers, and more. Box Dimensions (LxWxH) 7.8 x 6.8 x 1.3"
RocketU 1344A 4-Port USB 3.1 Gen 2 PCIe 3.0 x4 HBA Controller Card is rated 5.0 out of 5 by 1. Rated 5 out of 5 by Jan from Even I could install this component. Just snap it into place. It works great. I have 3 of the 4 ports in use already and they work great. Which ASMedia chip does this card use? Using PCIe 3.0 on a PCIe 2.0 slot (bottle neck): Would there be any performance advantage over the PCIe 2.0 card? Specs specifically do NOT mention compatibility with USB 3.0. Is it the case that this card is not compatible with 3.0? Is this device compatible with PCIE 2.0 slots? The performance should be the same if you are not sending data to all four ports simultaneously. PCIe 2.0x4 = 2000 MB/s should allow near full performance from two ports simultaneously. If the card uses the ASM2142 (PCIe 3.0x2), then a single USB port can be 20% faster than a card that uses the ASM1142 (PCIe 2.0x2). The PCIe switch can convert the two PCIe 3.0x2 USB controllers to PCIe 2.0x4.